A Kgalagadi Transfrontier Park holiday involves traversing exceptional Kalahari landscapes and observing fabulous wildlife and bird species in this amazing habitat. Visitors here can savour the immense silence and stunning night skies or set off on exciting Kgalagadi Transfronier Park activities such as game drives, adventurous wilderness walks and 4x4 trails. Trails into the Botswana section of the park must be in 4x4 vehicles in convoy. This area’s main attraction is prime predator viewing and seasonal migrations of large antelope species. There are also many other fascinating creatures such as Giraffe or Meerkat. Honey Badger (Ratel), Pangolin (Scaly Anteater) and Bat-eared Fox. Birding enthusiasts on a Kgalagadi Transfrontier Park holiday can spot around 280 species of which 92 are resident. Birds of prey are a speciality in this area. After a day of exploring this desert region, guests can retreat to their accommodation and enjoy a refreshing dip in the swimming pools at the main camps or simply sit back with a cool drink and watch the sunset over the Kalahari Desert. 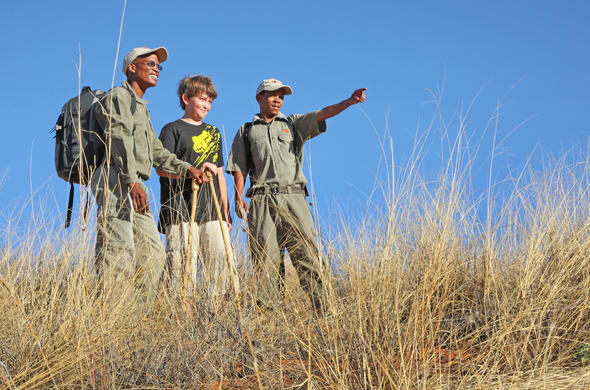 All camps are situated in unique areas and guests can truly get a sense of the ancient Kalahari. Lectures, slide shows and holiday programs are organised from the information centre at Twee Rivieren. Morning and sunset drives and morning walks are available at Twee Rivieren, Nossob, Mata-Mata and the Kalahari Tented Camp – these are subject to availability and weather permitting. There is also a Predator Centre to visit at Nossob. Due to the sparse vegetation and concentration of African wildlife in the dry riverbeds of the Auob and Nossob Rivers, Kgalagadi Transfrontier Park is a prime mammal viewing destination. Partake in nature walks and game drives through vast wilderness trails, or why not relax in the swimming pool at Kalahari tent camp while viewing the magnificent desert scenery that surrounds the area.